Jimmy Cricket headlined another “sparkling night of fundraising” in aid of a children’s hospice. 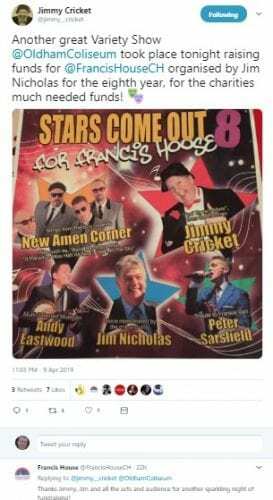 The eighth edition of Stars come out for Francis House show took place at the Oldham Coliseum Theatre on Tuesday 9 April. Appearing on stage along with popular comedian Jimmy were 60s rock band New Amen Corner, multi-talented musician and singer Andy Eastwood and Peter Sarsfield’s tribute to Frankie Valli. The event raised funds for the Francis House Children’s Hospice in south Manchester and was compèred by long-standing hospice supporter and entertainer Jim Nicholas. 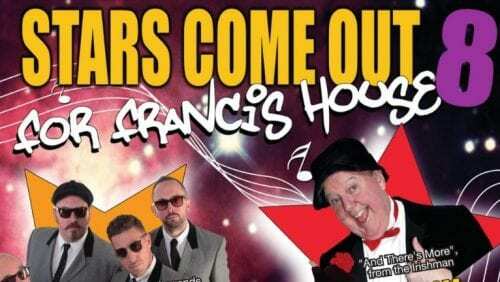 The Stars come out for Francis House show returns to the Oldham Coliseum Theatre on Tuesday (9 April). This will be the eighth staging of the event, which raises funds for the Francis House Children’s Hospice in south Manchester. This year’s line-up features popular comedian Jimmy Cricket, 60s rock band New Amen Corner, multi-talented musician and singer Andy Eastwood and Peter Sarsfield’s tribute to Frankie Valli. The event will be hosted by long-standing hospice supporter and entertainer Jim Nicholas. Visit here to book tickets. Jimmy Cricket will be teaming up with other stars from the world of showbusiness in October to raise money for charity. 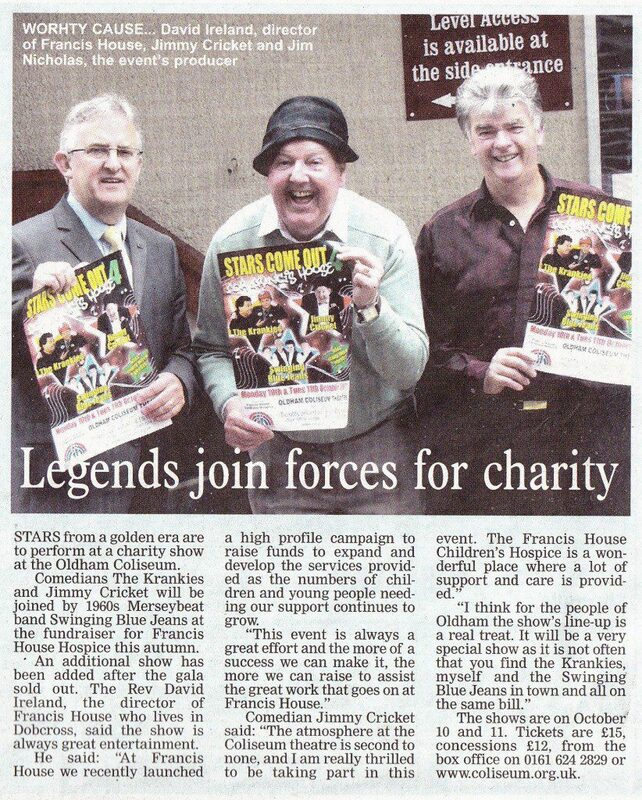 The legendary Irish comedian will be performing in the “Stars Come Out” show at the Oldham Coliseum as a fundraiser for the Francis House Hospice. Also appearing will be The Krankies – very good friends of Jimmy’s – and 1960s Merseybeat band Swinging Blue Jeans. The show will now be on October 10 and 11 after the originally-planned one-day performance was sold out. Jimmy says: “It will be a very special show as it is not often that you find The Krankies, myself and the Swinging Blue Jeans in town and all on the same bill. Easter greetings from ‘wonderful’ Guernsey! Fantastic entertainment and good, clean fun in Port Sunlight!